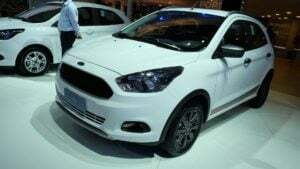 The Ford Figo Cross made its public debut as the Ford Ka Trail in January this year. Since then there have been many speculations regarding the India launch of this model. The Ka Trail is nothing but a slightly ruggedized version of Ford’s B-segment hatchback. It will come with several styling updates, such as body cladding and revised bumpers. Other highlights will include a higher ground clearance and a touchscreen infotainment system. 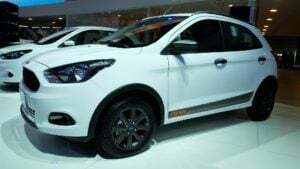 In essence, it will be to the Figo what the i20 Active is to the Elite i20. It may be noted here that the Figo hasn’t been doing too well on the sales charts. The upcoming crossover model is likely to help Ford India post better figures on the monthly sales charts. Rumours abound that the upcoming Ford car will have a new 1.2-litre three-cylinder Petrol engine. This engine will replace the current 1.2-litre four-cylinder unit. The new Dragon series motor should offer a good mix of performance and fuel mileage. The 1.2-litre four-pot motor that does duty on the Figo has received a lot of flak for its lacklustre low-end performance and rather average fuel mileage numbers. 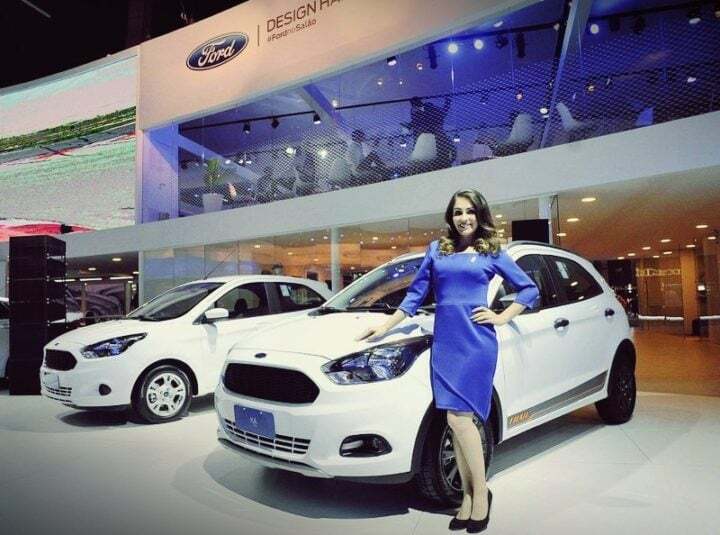 Ford India is yet to share any official detail on the India launch date of the new Ford Figo Cross. However, we think the new model will make its India debut at the Auto Expo 2018. Thereafter, the SUV-ish car could launch in the first-half of 2018. 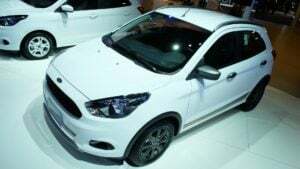 The Ford Figo Cross is already on sale in Brazil as the Ka Trail. 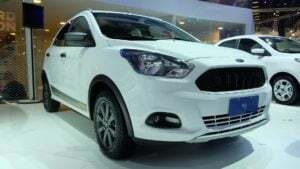 The latest-generation Figo was launched in India in 2015. Sadly, it hasn’t really been able to set the sales charts on fire. Hence, the introduction of the Cross model could do a lot of good to the sales performance of the new generation car. Quite obviously, the Cross version will command a significant price premium over the regular Figo. Prices of the regular Figo currently start at Rs 4.8 lakh. The top-end model costs Rs 7.7 lakh. The new Cross version could command a price premium of Rs 50,000-60,000. The increase in price will be justified thru a more rugged exterior, more features and the new petrol engine. While the 1.2-litre motor will be new, we expect the Figo Cross to get the remaining two engines – 1.5 Petrol, 1.5 Diesel – to make it to the Cross version without much change. In Brazil, the Ka Trail comes with a 1.5-litre Sigma four-cylinder petrol engine that outputs a max. power of 110 BHP and a peak torque of 146 Nm. It comes mated to a 5-speed Manual Transmission. In India, however, the new model is likely to get a new 1.2-litre three-cylinder petrol engine instead of the current four-cylinder motor. The 1.5-litre Petrol and the 1.5-litre Diesel engines on the Figo will remain unchanged. The 1.5-litre Petrol motor outputs 110 BHP and 146 Nm. It comes mated to a 6-speed DCT automatic transmission. The Diesel engine outputs 99 BHP and 215 Nm. It comes mated to a 5-speed Manual Transmission. Specs-wise the 1.5-litre Petrol and Diesel engines remain unchanged. Hence, there won’t be any change in the mileage they’ll deliver. The new 1.2-litre Petrol engine is likely to deliver around 21 KMPL. In comparison, the Figo’s current 1.2-litre engine outputs roughly 19 KMPL. Also, thanks to a really mediocre low-end grunt, the engine fails to deliver a very high mileage in real-world driving conditions. All this is likely to change with the advent of the new 1.2-litre, 3-cylinder Dragon series engine. This engine will also make it to the regular hatchback. The Ford Figo Cross will offer many new features. Above are the features highlights of the new model. As with most such hatchback-based crossovers, there won’t be a huge departure from the donor car’s design. The Cross version will look much like a Figo on steroids. Thanks to a much higher ground clearance and bigger alloy wheels, it will have a bolder stance. Also, the higher ground clearance will help it tackle broken roads and speed-bumps better. The bumpers will be updated and there will be faux skid plates and plastic cladding on the wheel arches. This will help the car have a more rugged look. 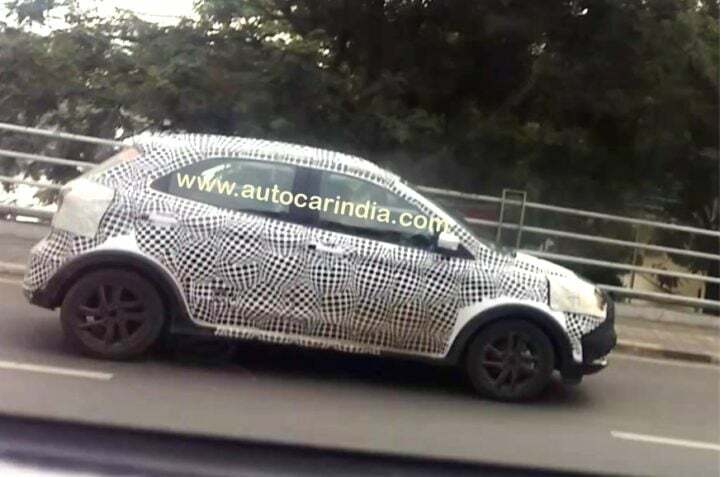 While not seen on the test mule seen in the spy images, we are sure the car will even have a black-painted roof, ORVM caps and roof rails. There won’t be too many changes on the inside. The car will likely get a new upholstery with contrast stitching and bits like sports pedals and door sill plates. A highlight here will be the touchscreen infotainment unit that will support Apple CarPlay and Android Auto. We are pretty sure the Figo Cross will be available in top-spec trims only. 7 New Ford Cars Headed to India! 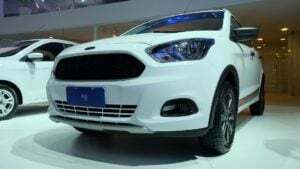 Not much more is currently known about the new Ford Figo Cross launch date, price, specifications, and mileage. However, we’ll update you with latest news on the upcoming model. So, do stay tuned for more.